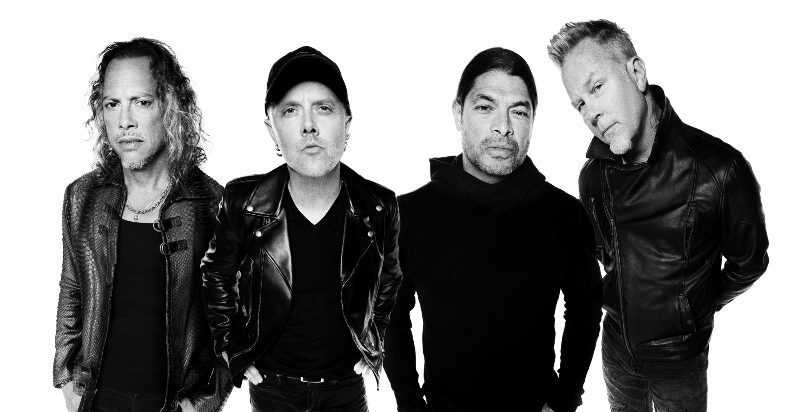 Fan club presale begins February 5 at 10am local time. Citi is the official presale credit card for the tour. As such, Citi cardmembers will have access to purchase presale tickets beginning Tuesday, February 5 at 10 a.m. local time until Thursday, February 7 at 10 p.m. local time through Citi’s Private Pass program. For complete presale details visit www.citiprivatepass.com. General on-sale begins February 8 at 10am local time at LiveNation.com. Full routing below. For more details, please visit www.shinedown.com. 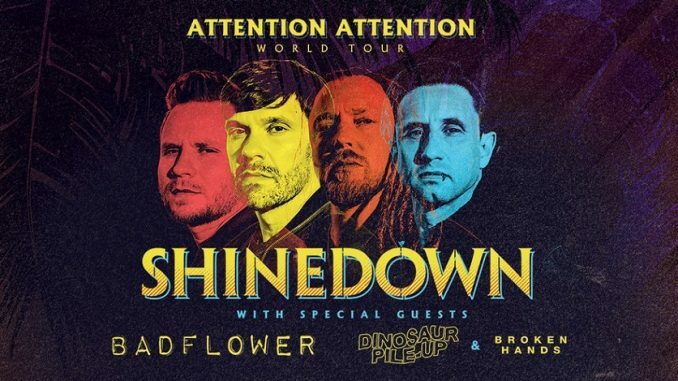 Shinedown’s ATTENTION ATTENTION World Tour kicks off February 20 in Estero, FL at Hertz Arena, which will see the band pack arenas backed by their biggest, most eye-popping production yet. Papa Roach and Asking Alexandria open. Amidst the tour, Shinedown will kick off a more intimate, limited run of shows in May entitled ‘An Evening With Shinedown,‘ offering fans an exclusive, up-close-and-personal live experience. These special shows, inspired by the high demand for tickets to Shinedown’s three intimate, year-end shows at the House of Blues in Orlando, begin May 6 in New Orleans at The Fillmore and will include back-to-back nights in Atlanta, Myrtle Beach, and Nashville. 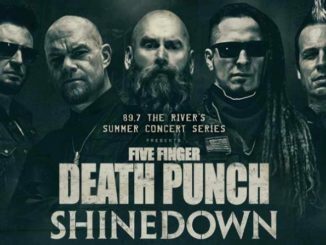 Additionally, Shinedown will return to their roots in Jacksonville, FL for an epic set at Welcome to Rockville on May 4, and will headline WNOR Lunatic Luau 2019 on May 17 in Virginia Beach, VA, MMRBQ on May 18 in Camden, NJ, Rocklahoma on May 24 in Pryor, OK, Inkarceration Festival on July 12 in Mansfield, OH, and Riff Fest on July 13 in Detroit, MI. For all ticket details, please visit www.shinedown.com. PRESS HERE to watch Shinedown’s new video for their anthemic single “GET UP,” a collection of behind-the-scenes moments on tour and live footage from the road that gives an inside look into the powerful moments that “GET UP” is fostering between Shinedown and their fans. 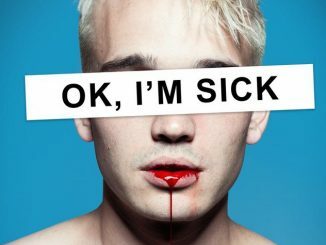 The uplifting #1 Active Rock and Top 25 Alternative hit has amassed more than 27 million total streams, galvanizing listeners around the globe with its offer of hope, empathy and encouragement in the face of personal struggles, whatever they may be. PRESS HERE to watch Shinedown’s recent performance of “GET UP” on Live with Kelly and Ryan. Garnering praise from the likes of Huffington Post, Salon, Rolling Stone, Consequence of Sound, Buzzfeed, Parade, Grammy.com, No Depression and more with key playlisting on Spotify and Apple Music, the powerful song speaks to the human spirit in a time of need, something that front man Brent Smith is deeply connected to after battling his own personal demons. “GET UP” became a light in the darkness, born out of Brent watching his friend, Shinedown bassist Eric Bass, deal with clinical depression. When Brent put pen to paper, a beautiful, universal song rooted in Brent and Eric’s raw vulnerability took shape. Reaching far beyond any genre or label, “GET UP” quickly began resonating, soundtracking TODAY‘s look back at 2018, breaking a new record for Shinedown by giving the band the most Rock Airplay Top 10s ever and their 13th #1 on Billboard’s Mainstream Rock Songs Chart (the second most in the history of the chart, tied with Van Halen), and becoming a fan favorite at arena shows on tour where the crowd response is palpable. Additionally, Shinedown has been nominated for two iHeart Radio Music Awards including Rock Song of the Year for #1 Active Rock hit “DEVIL” and Rock Artist of the Year. Shinedown’s chart-topping album ATTENTION ATTENTION (PRESS HERE to listen), out now viaAtlantic Records, simultaneously hit #1 on Billboard’s Alternative, Top Rock and Hard Rock Albums Charts and debuted Top 5 on the Billboard 200. The story that unfolds as the album progresses is a poignant and enduring statement about humanity, touching on topics such as overcoming struggles, mental health, not being afraid to fail and the resolve of the human spirit as seen on tracks like “DEVIL,” and the anthemic “THE HUMAN RADIO”. Given the deeply personal nature of the record, Shinedown went in-house for production for the first time ever, enlisting bassist Eric Bass to produce and mix the album in its entirety.